I enjoy reading books that are set in North Dakota, so even though this is the second book in a series, I jumped at the chance to review it. 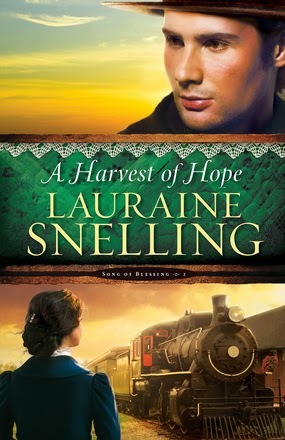 A Harvest of Hope by Lauraine Snelling was a lot of fun, and it was easy enough to step into the series at book number 2. It felt fairly obvious that I had missed part of the story, but this novel does stand alone in spite of that. While in Chicago, Miriam has tried to get Trygve Knutson and Blessing out of her mind, but his letters make that impossible. Trygve is busy building a house, hoping he can convince Miriam to return to North Dakota and marry him. Torn between Trygve's love and her family's needs, she doesn't know what to do. When Miriam finally returns to Blessing, she buries herself in her work. But no matter how hard she tries to put it off, she has some life-changing decisions to make about her future, her family... and the man who is never far from her thoughts. First off, the above description seems to be mostly of the first book in the series. A Harvest of Hope pretty much opens with Miriam heading back to Blessing, North Dakota to fulfill her nursing commitment. Of course, she is heading back after her mother has died. Because I just needed to be reading about an adult coping with the loss of her mother right now. But back to the review here. I have read other books by Lauraine Snelling, and she does a good job of writing North Dakota. One thing I loved with this particular book is that the names really brought me back to people I knew in my childhood. While Trygve isn't a name I know at all (nor am I completely convinced I can pronounce it), many of the other members of his family have names that remind me of that older generation. Names like Hjelmer, Kaaren, Lars, Elmira, Katja, and Linnea. The writing is solid, and the plot isn't exactly predictable. There are some completely unexpected twists and turns, and I found myself really caring about Miriam and especially for the widows. There were many in the story who had experienced fairly recent loss, and in spite of my flippant tone above, it was a good thing for me to be reading about how these characters were dealing with the death of a parent, a spouse, or another relative. I just would rather have read all of that a couple weeks from now instead of right after my mother died. I'm going to be looking for book number 1 in this series.